This week I attended a webinar which focussed on silent learners. Thank you to Martina Emke for drawing this webinar to my attention. 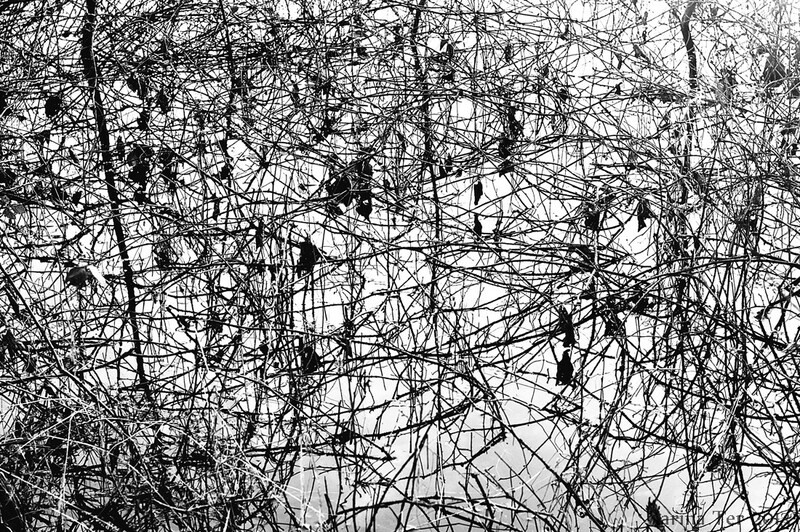 The title immediately resonated as recently I have found myself increasingly troubled by the constant noise of the online environment. This has been a growing awareness and I recognise it as a problem since I rely on the open web and my online network for the work I do as an independent education consultant and researcher. This has made me wonder to what extent open learning environments exclude those who find ‘noisy’ environments difficult. 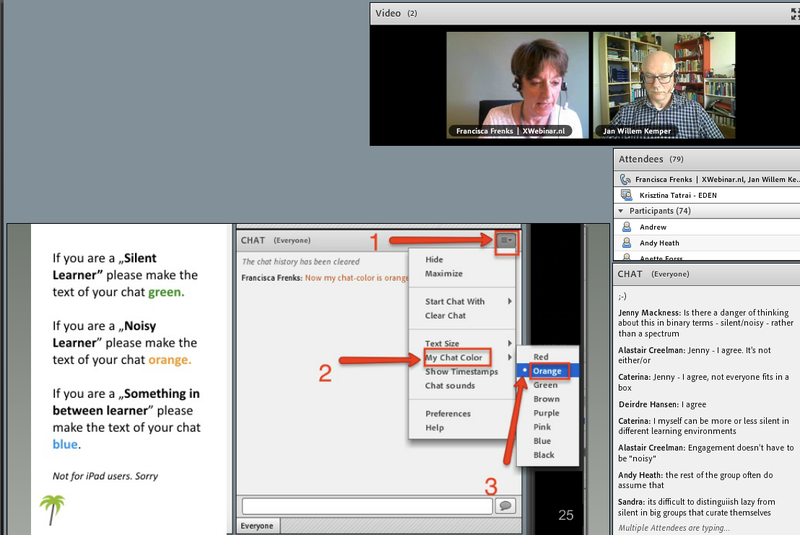 The webinar was very ably facilitated by Francisca Frenks, Alastair Creelman and Jan Willem Kemper – more than ‘ably’ in fact. 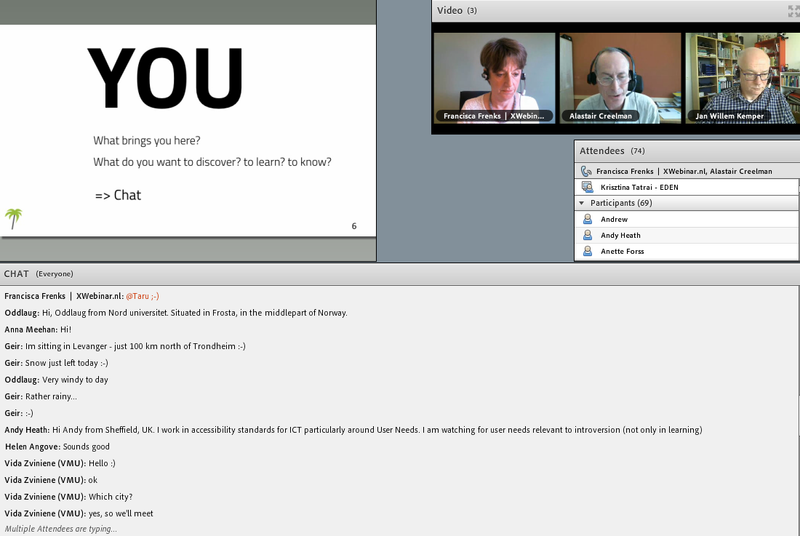 This was probably one of the best webinars I have attended (and over the years I have attended very many). It was extremely well structured and very interactive. I would like to spend a bit of time at the beginning of this post recording how it was run for future reference and as an example of good practice. There were 72 people in the webinar – quite a big number to manage. Most participants were from Scandinavia, but some were from further afield. These are the points that I think made it work so well. There were very good joining instructions and email reminders of the event. We were invited to log in half an hour early to check our connection. 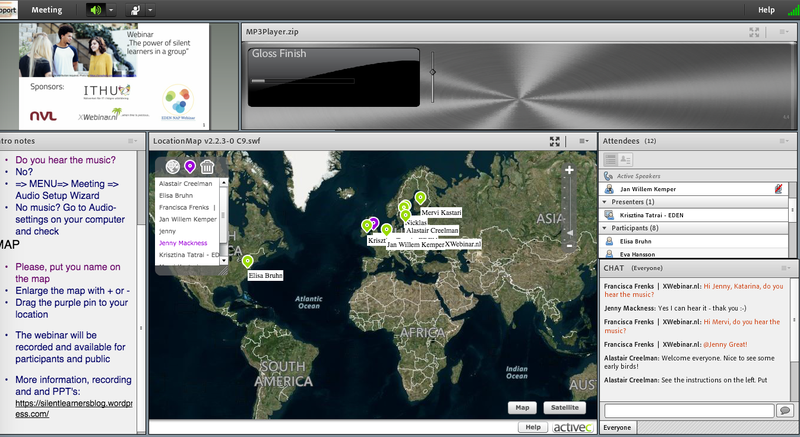 Microphones and videos were not enabled until the end of the webinar, but the opening screen invited us to interact by marking our location on the map and using the chat. Clear instructions were written on the screen and reiterated by the presenters. The presenters were in the room with their microphones open and welcomed us both verbally and in the chat. Changing the layout of the screen by dragging and dropping boxes was either not enabled or is not a feature of Adobe Connect. If it had been I would have moved the chat to my second monitor – but it was not a problem. 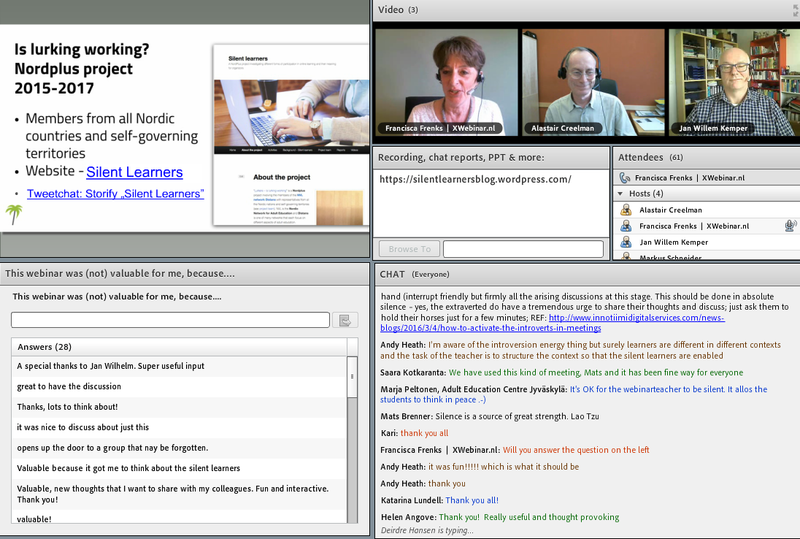 What I particularly liked about the whole webinar was that the presenters changed the layout of the screen according to the activities they had planned for us. After an introduction to the presenting team and the background to this webinar, interaction started almost immediately and we were asked ‘What brings you here? – a nice open, opening question. The chat box was enlarged to help us to follow it more easily. The focus of the webinar was then explained. Before the webinar we had been asked to watch Susan Cain’s well known video on introverts. We were told that when discussing silent learners in this webinar the focus would be on learners who are silent by nature rather than silent for other reasons. How do we recognise learners who are silent by nature? How can we empower the silent learner in the group context? The focus for discussion was therefore made very clear. We were then asked the questions listed above and asked to respond to them in the chat, but before responding to each question Francisca interviewed Jan Willem, a self-professed ‘silent by nature learner’ about his experience in relation to the question. What was particularly effective was that we were asked to identify ourselves as a silent learner, a noisy learner, or something in between, by typing in a particular colour. ‘It is simply easier to study independently at my own pace’. ‘I have no need to express myself loud among others’. ‘I hate spontaneous discussions because I don’t know what appropriate is to say’. ‘It is easier to join an online discussion, because the structure is more clear’. All the questions and statements in the webinar promoted fast and furious typing in the chat box and although I have watched the recording it would take a while to go through it all and determine more fully how silent learners are perceived or perceive themselves. I thoroughly enjoyed this webinar. The time flew by. Not only was it extremely well run, but also thought provoking. The main thought I have come away with is to question whether it helps silent learners to focus on them in this way. Jan Willem felt it does, because he feels that there is not enough recognition of what silent learners can offer. For me the danger is that in doing this we may reinforce the view that somehow silent learners are a problem and that we need to solve this problem by enabling them, empowering them, to become a bit noisier. Personally, I don’t think that learners can be empowered by others. They empower themselves, although they can be supported in doing this. In addition, I don’t believe that silent learners can be identified as a separate group, although they can, as we saw in the webinar, self-identify. Learners will be more or less silent/noisy as individuals and according to the context. Thinking of silent versus noisy is probably not helpful. There will be a spectrum of learners and perhaps diversity is best served by keeping groups as heterogeneous as possible and ensuring that multiple perspectives are always considered. This webinar attracted a cross-section of silent and noisy learners and many in between and we were invited to identify ourselves as silent, noisy or in between learners. This showed that we were a diverse group, but the discussion focused on silent learners as a separate group. It would be interesting to go back through the chat and analyse whether silent learners are considered to be ‘a problem to be solved’ or whether they are considered to be necessary to a diverse community of learners, even though they are in the minority. 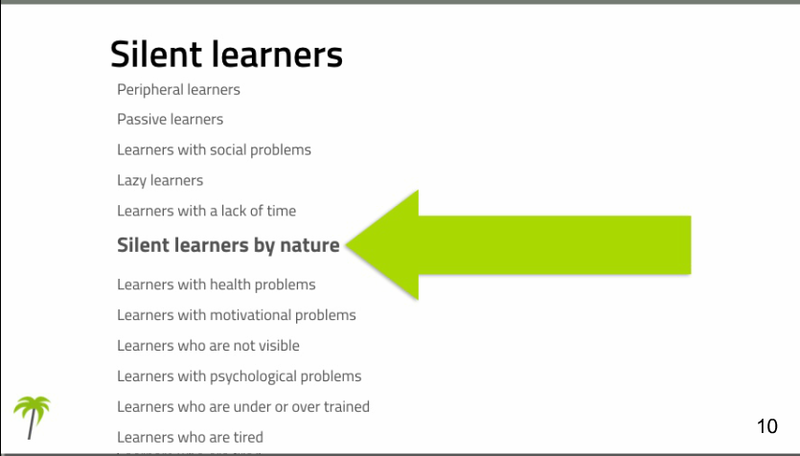 Evidently only 20-25% of the population identify themselves as silent learners. 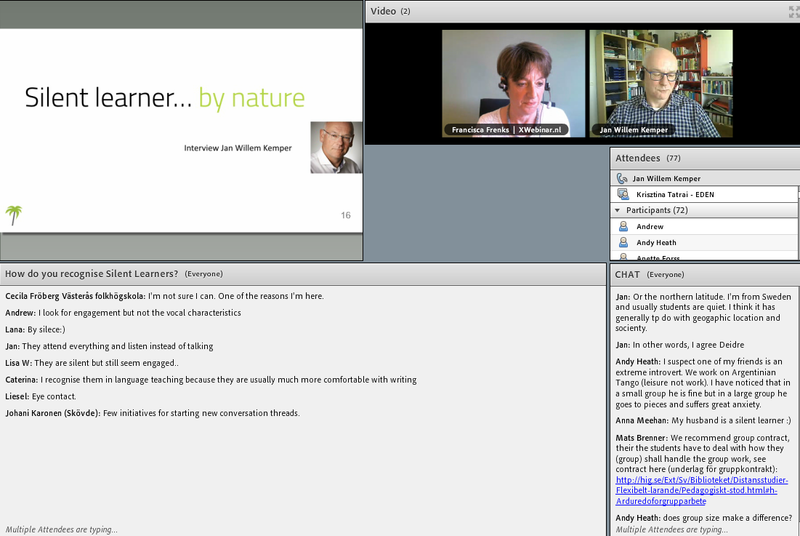 Thank you to Francisca, Alastair and Jan Willem for organizing this excellent and thought-provoking open webinar. See also Lotte Christoff’s post – A Voice of a ‘Silent Learner’ – https://studyelearning.wordpress.com/2017/03/19/a-voice-of-a-silent-learner/ The post is written in Swedish, but translates well enough to follow the text.